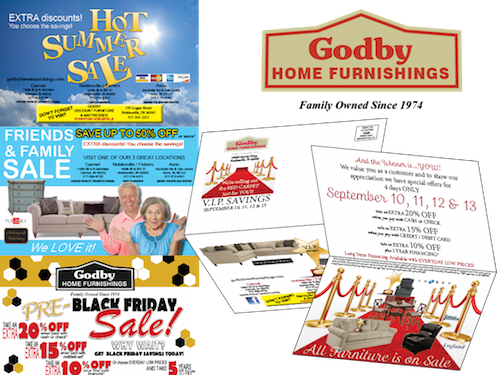 Based in Noblesville, Indiana, Godby Home Furnishings has long been a client of Media Factory - dating all the way back to 2004. This family-owned company works with MF to print and mail envelopes, bi-fold mailers, and tri-fold mailers. For their VIP sales, MF mails fliers to 1/3 of Godby’s 100,000+-person mailing list. They enjoy working with MF to print and mail unique fliers for the sale each month. Over the years, both Godby and MF have grown as companies and as partners in printing. “The trust we’ve developed with Godby is exactly what we want with all of our clients. We strive to make their lives easier and their organizations successful so they keep coming back to the Factory,” said Director of Marketing Amy Durbin.